Lifestyle creep is real and holds up to its name. It wasn’t till I started the moving process till I looked back and realized that it had already happened to me. Some of the changes in spending were necessary, such as moving to a better complex. However, looking back there were areas where money could have been saved and was potentially wasted. During college I lived with three other roommates. We were as frugal as one could possibly be without eating noodles every night. This type of attitude continued when I went to medical school. I continued living with roommates and lived very frugally. For the first year after residency, I lived as cheaply as possible, spending $600 a month in an area where average rent for residents were almost double that amount. After one year at this place I decided to move. There were multiple factors that are involved with the move, including poor maintenance and safety concerns at the previous apartment. Also, my fiancee was moving in with me and at this point I decided to splurge a little. The apartment I rented with bills was more than twice the apartment that I rented for my intern year. Lifestyle creep had begun. First, it was me justifying the expensive complex since its in a safe neighborhood. So safe that it is surrounded by million dollar homes. It also didn’t hurt that there was a nice pool (see picture), BBQ pit, and great amenities. All things that I talked myself into me feeling like I NEEDED them. Once we were moved in, next came the goods. Now that I was living in a nice apartment we felt like we needed nicer things. Suddenly I’m buying more expensive kitchenware, a patio set to enjoy my new deck, and some art to fill up the walls. Each purchase was in the “extra” budget, but each one was somehow justified. The mind really can convince us of whatever we really want, and I was convinced I needed these things. Now, I’m not saying that I had to live like a person living in a third world country, but did I really need that kegarator (still debatable)? This realization hit me about the time I was getting ready to look for a place to move in Austin. Around this time I was also reading blogs like MrMoneyMustache. This got me motivated to get back to the essentials. While touring apartments that my friends were renting in Austin, I asked myself if I really needed to spend $2k+ on a 800 square foot apartment. While many of my friends after graduation have gone out and bought a new car, new house, or went on expensive vacations, I decided to get back to the basics at this stage in my life. The average rent in Austin according to zillow is about $1200 per month. My rent will be $700 a month, all bills included. Definitely getting back to basics! 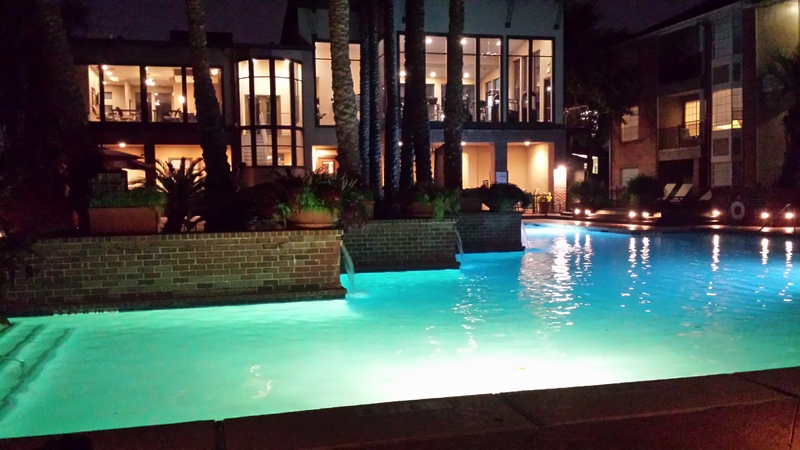 The pool at my expensive apartment complex while in residency. What will I do with the money saved? I still have about $80k left in my debt and plan to pay this off as quickly as possibly while I also start saving for retirement. My plan is not to live so frugally that I don’t take any enjoyment out of being a new attending. The plan is to be as frugal as needed to still enjoy life but pay down debts. My fiancee has started to call this Monk Mode which I think has a nice ring to it. Overall, I think its important to stay on the look out for creeping unnecessary expenses. For now, I’ll say goodbye to the pool and nice complex and hello to my frugal place in Austin. I’ll be sure to post an update 6 months in to update how things are going. You’ve got the right idea. Looking back 30 years after finishing my residency, if I had only continued to live like a resident and focused on eliminating all my debt, I would have a much, MUCH larger nest egg, and the freedom it provides. That’s what I tend to hear a lot of attending physicians who are more senior than I am say. Even despite my best efforts while in residency, the move to a new job really opened my eyes to make me realize that lifestyle creep was already happening to me. Of course, its not always about the bottom line. Some expenses that lead to good memories are worth more than a good return in the stock market.